It started out as a morning walk, but ended up with a 57-year-old grandpa laying partially paralyzed in an Alabama hospital bed. Sureshbhai Patel, who is visiting from India, needed spinal fusion surgery to repair damage to his back after his family says police officer Eric Parker in Madison twisted his arm and forced him to the ground. Officer Eric Parker was arrested on Thursday, Madison police Chief Larry Muncey said. Officer Eric Parker faces a charge of misdemeanor third-degree assault. Parker turned himself in to sheriff’s officials, the chief said. The department released two videos shot by cameras on the dashboards of police cars at the scene. The video shows an officer slamming the man to the ground. 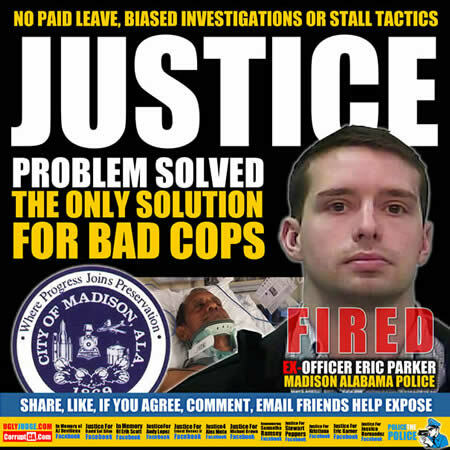 Madison, Alabama Officer Eric Parker is facing charges of third-degree assault for slamming a 57-year-old Indian man on the ground and paralyzing him. The victim, Sureshbhai Patel, was simply walking down the street while having brown skin when a “concerned” citizen called the cops on him for walking in the predominantly white neighborhood. Patel was visiting his son and new grandchild when the incident took place. He repeatedly indicated that he did not speak or understand English, and kept gesturing toward his son’s house. Instead of leaving him be, Officer Parker slammed him to the ground, paralyzing the innocent, frightened man.